We have a proud history of environmental achievements. Being the first to mass-produce the pioneering hybrid vehicles back in 1997, we have gone one step further by launching the Toyota Mirai - the first mass-produced zero-emission hydrogen fuel cell sedan in 2015. Since its launch in 2015, the Toyota Mirai has attracted attention and praise from governments, media, industry authorities, partners, science institutions and our very first customers. The Mirai marks the start of a new age of hydrogen-powered zero-emission mobility. We are very proud to receive such a warm welcome and recognition amongst members of society across Europe. TOYOTA Mirai | 1st customers - Mikael Sloth, Denmark. TOYOTA Mirai | 1st customers - Olivier Weinmann, Germany. TOYOTA Mirai | 1st customers - Theo Etrue-Ellis, United Kingdom. TOYOTA Mirai | 1st customers - Nikolaus Schuss, Germany. Industries and governments are catalysts to support infrastructure development necessary to the further expansion of the fuel cell technology. Last year there were already 40 refuelling stations in the European countries where the Mirai went on sale, with hundreds more to follow. German Chancellor Angela Merkel visits Toyota stand at the Frankfurt Motorshow to see the world's first mass-produced hydrogen-powered car Toyota Mirai. Flanders Vice-Minister-President Annemie Turtelboom on hand to demonstrate support for building hydrogen infrastructure in Flanders by Air Liquide. Mayor of London Boris Johnson visits Toyota Headquarters in Japan and confirms “Transport for London” as a first customer for the Toyota Mirai in the UK. ITM Power plc and greentomatocars, manufacturer of integrated hydrogen energy solutions and London’s first green private car service respectively are welcoming Toyota Mirai in their fleet. We are honoured to be awarded by the members of the media and the scientific community; the recognition we receive from unbiased and independent authorities in their respective fields is a great support in sharing our message to bring the real change and help the world meet critical environmental challenges. We have been awarded with the Business Awards 2016, in the Corporate Responsibility & Environment category. Here is the excerpt from our acceptance speech by Tony Walker: “Fuel cell vehicles are able to generate their own electricity from hydrogen, making them a key factor in creating the future Hydrogen Based Society. The Toyota Mirai has been declared the 2016 World Green Car of the year at a press conference hosted by the New York International Auto Show. It has been elected by a jury of 73 international automotive journalists from 23 countries. Karl Schlicht, EVP Sales & Marketing at Toyota Motor Europe, commented “As recognized leaders in Hybrid technology, we are truly honoured to have received such an important award. The Austrian automobile club ARBÖ has awarded the Toyota Mirai with the “2015 Environmental Award” in category of “Current Innovative Environmental Technologies”. The Toyota Mirai landed at the top of the Germany‘s Center of Automotive Management’s ranking of the world’s 100 most significant automotive engineering innovations. To make their ranking, the CAM team, closely examined more than 8,000 new innovations in the period from 2005 to 2015. These were rated according to their relevance to the market and industry as well as their innovativeness. 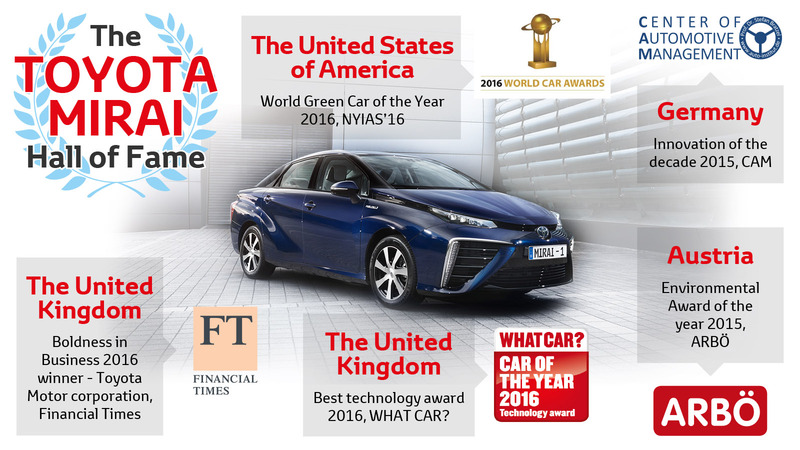 The Toyota Mirai has been honoured with the Technology Award in the 2016 What Car? Awards. “Supporters say hydrogen fuel cell technology holds the key to the future of sustainable motoring. Critics point out that there is next to no recharging infrastructure, that developing it will be hugely costly and that the fuel cell technology itself is far too complex and expensive to hold any mass appeal. Our judges’ counter to that was that all-new technologies need early champions, and that Toyota’s bravery in trying to force change is to be applauded.” Jim Holder, What Car? Editorial Director. Long-distance driving with Toyota Mirai - a hydrogen fuel cell car Europe’s network of hydrogen fuelling stations is continually expanding. In practice though, is it really possible to drive a hydrogen fuel cell car from northern Europe to southern Europe? Jacob Krogsgaard, CEO of H2 Logic, put it to the test with his Toyota Mirai. The Toyota Mirai: A start for the better Our world faces many challenges, with Mirai we are making a start for the better, to ensure that we can enjoy a future that cares about the environment. Fuel Cell Technology Fuel cell vehicles (FCV’s) are powered by fuel cell stacks, which generate electricity from a reaction between hydrogen and oxygen from the air. We choose hybrid Around the world a growing movement of like-minded people that stands over 10 million strong is united in saying, we choose hybrid.